Well it’s looking like a question a lot of people had has been answered what happens AFTER we finally run out of Naruto manga. 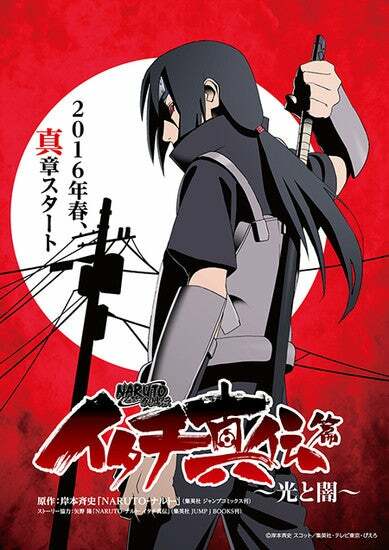 Well it’s looking like the first stop will be the series of spin off novels the first which seems to be fan favorite Itachi’s series, Itachi Shinden. Which will air in Spring 2016. I have not read any of the spin off novels to be honest so I can’t vouch for their quality however its nice to know we may be moving on from Naruto (and its filler...) after so many years. Also I’ve always liked Itachi as a character. So I’m excited. Furthermore these novels being Gaidens and sequels to the series (Kakashi’s tells the story of Naruto and Hinata’s wedding) seems to signal we may finally have our Naruto Shippuden ending by Spring of next year. Of course this could be a 12 episode arc within the main anime in the place of a filler arc (ala Fairy Tail Zero), however considering the manga has enough material to cover the gap in time I’m hopeful well get canon material in the anime again soon and see an end to the filler at least for a while. Also who wants to bet every novel will be adapted then Naruto Gaiden itself after we really do run out of manga material?